After a week of insignificant data releases 10-Yr yields end close to unchanged (2.758) and the 2-10 spread tighter at 14 (curve flattened). Wednesday’s ECB statement took on a dovish tone as it highlighted that risks to growth have now moved to the downside. Those statements come one week before the first ever post FOMC meeting press conference with Jerome Powell where analysts are eager to see if there are any adjustments to balance sheet language. Also taking center stage is the release of January’s employment data next Friday. Treasury yields end the week with a move to the upside following stocks on the back of the president signing a bill to end the government shutdown. 2-10 spread tightened to 14. At Wednesday’s ECB press conference Mario Draghi painted a less than perfect picture of the European economy after rates were left unchanged. Draghi said that incoming data has been weaker than expected and near-term data is likely to be weaker than previously anticipated. The ECB feels that significant stimulus is still needed, and headline inflation is likely to decrease in the coming months. Markets are clearly affected by the uncertainty swirling around the UK exiting the EU on March 29, 2019, without a deal in place. If they fail to put one in place by the end of February, then the UK will more than likely apply to extend Article 50 and thus Brexit will continue to drag on. 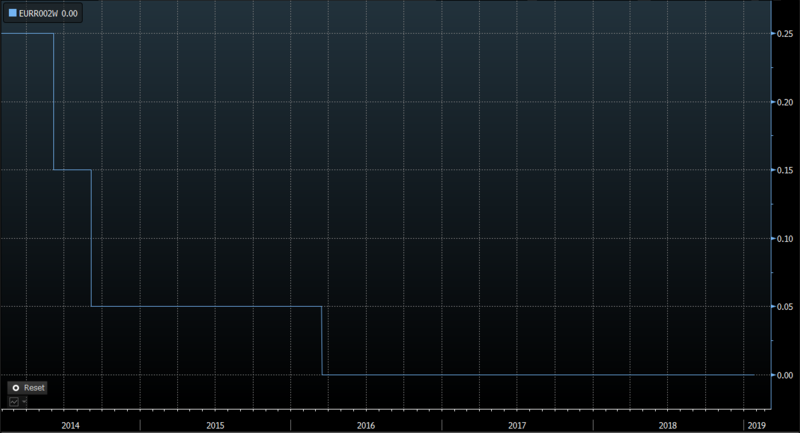 ECB left rates unchanged on January 24, 2019, and reiterated that it expects key interest rates to remain at record lows at least through the summer of 2019. The FOMC meets Tuesday, January 29, and Wednesday, January 30. A policy statement will be released on Wednesday at 2:00 pm EST followed by a press conference with Jerome Powell at 2:30 pm EST. Rates are expected to remain unchanged. 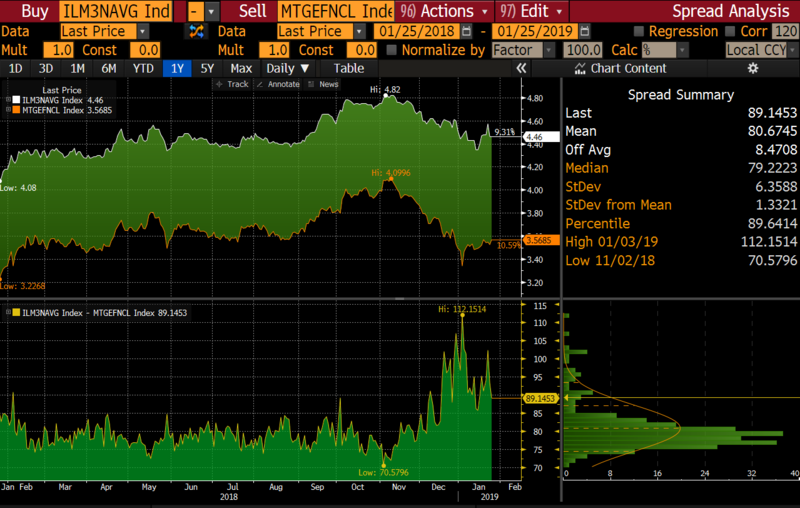 Based on their recent dovish tone regarding rate increases the market looks for any change in guidance regarding balance sheet normalization and if two hikes are still on the table for this year. While jobs data remains strong one cannot overlook the effect the shutdown might have on first-quarter growth. The press conference will be Powell’s chance to calm markets after throwing them into a tizzy last month. The government shutdown is officially over, or at least until February 15, 2019. The president signed a bill on Friday that temporarily reopens the government while negotiations continue over how to secure the nation’s southern border. So, what happens if no agreement is made? President Trump said, “If we don’t get a fair deal from Congress, the government will either shut down on February 15, or I will use the powers afforded to me under the laws and Constitution of the United States to address this emergency.” Even though it is uncertain as to what will happen in three weeks, the fact that some type of agreement was reached caused stocks and yields to both rise on Friday. 10-Yr yields continue to follow stocks lead (Dow in pink). Both rose on Friday after Trump unexpectedly ended the government shutdown. The primary/secondary spread remains wider. Tighter spreads are attributed to lower mortgage rates. The primary/secondary spread measures the difference between mortgage rates borrowers pay and the par MBS yield in the securitized market. Yields ended last week slightly higher after the government reopened on Friday. Mortgages outperformed treasuries and swaps on Friday. 30-Yr were roughly 2 ticks tighter vs. hedge ratios and 15-Yr were tighter by a + to 1+. 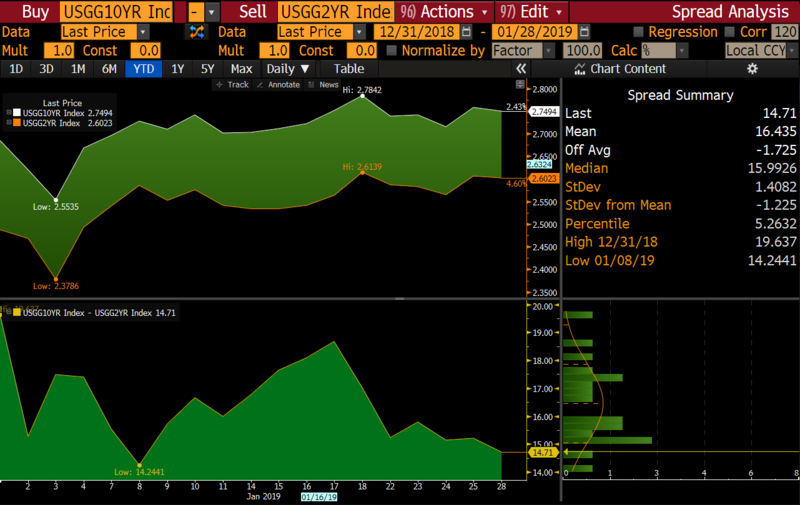 The 2-10 spread ended last week tighter at 14 and with the amount of front end auction volume coming on Monday and Tuesday we could easily see further flattening. The spread between GN30 and FN30 coupons remained mostly unchanged. 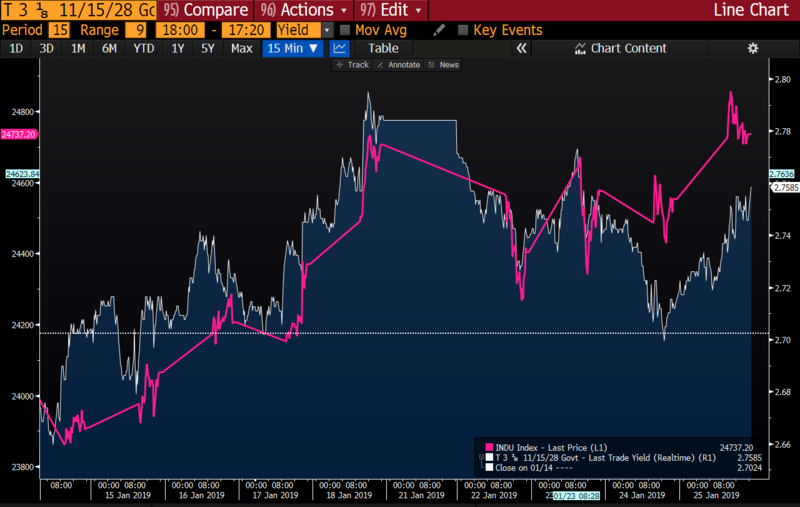 After months of falling, 10-Yr yields have been slowly rising since January 4, 2019, but this trend could reverse if the Fed continues its dovish commentary and employment data has a weak showing on Friday. Watch for 2.75 on the support side and 2.69 on the resistance side. 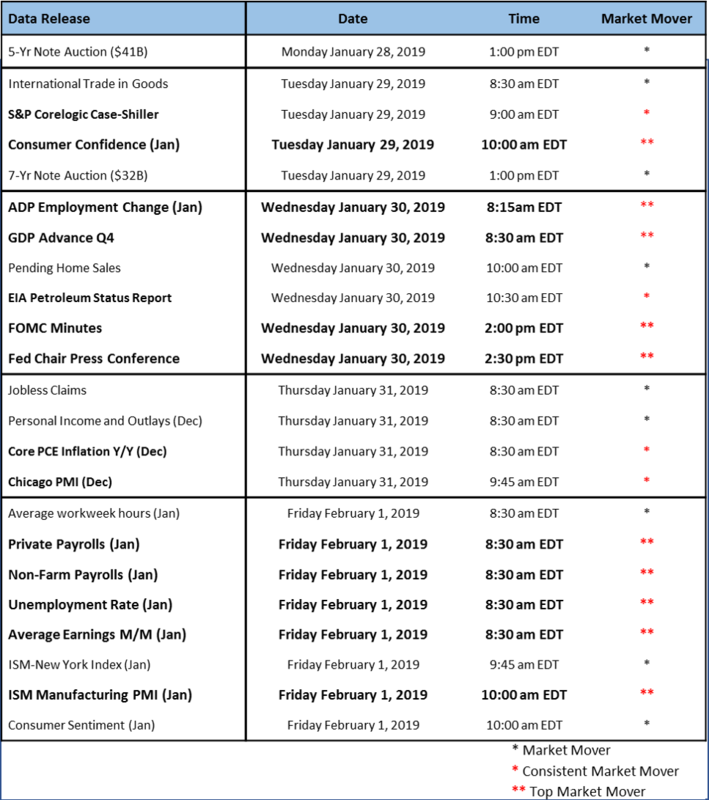 This could be a very volatile week as there is a large supply of front-end auctions Monday and Tuesday, FOMC minutes on Wednesday, and employment data on Friday. The Non-Farm Payrolls number will be unaffected by the shutdown, but the household survey will likely be questionable after the government shutdown. It remains to be seen if the data not released last week due to the shutdown will start to trickle out this week. We did not receive Retail Sales or Nondefense Ex-Air data on Friday. 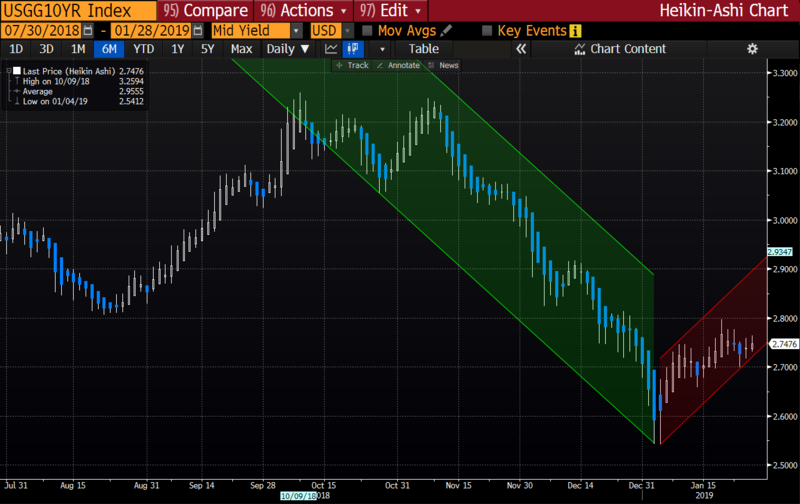 Posted 29 Jan 19 in Recent News, Secondary Markets Commentary.